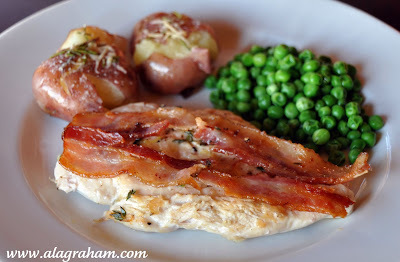 Anyway, here is another recipe with chicken and bacon that I found completely satisfying and super easy to make! Note: Jamie uses 6 slices of prosciutto in place of the bacon and he also uses the zest of 1 lemon. 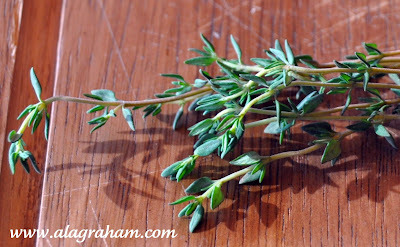 Grate your Parmesan and pick the thyme leaves off the stalks. 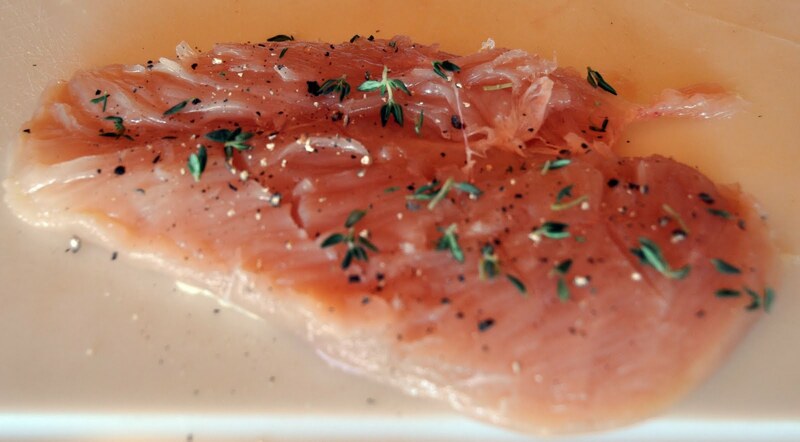 Cover the chicken with plastic wrap and take a heavy pan or a meat tenderizer and smack the chicken breasts until they are nice and even, about 1/2 inch thick. 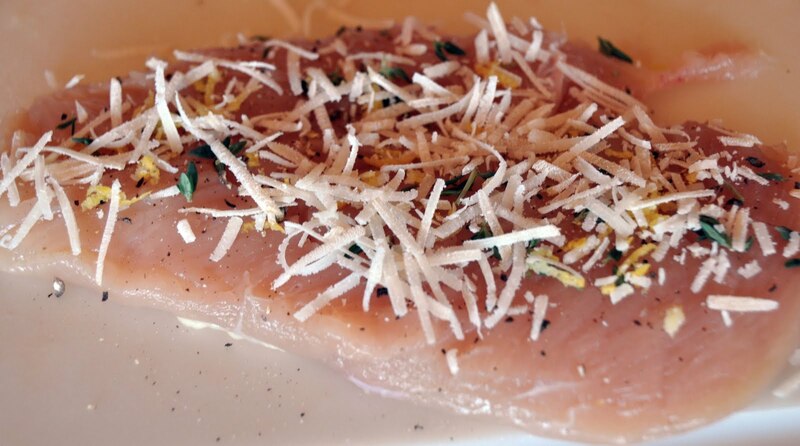 Season chicken breasts with a little pepper and thyme. Lay 2 bacon slices on each chicken breast. Sprinkle with the remaining thyme leaves. Heat a skillet over medium heat. 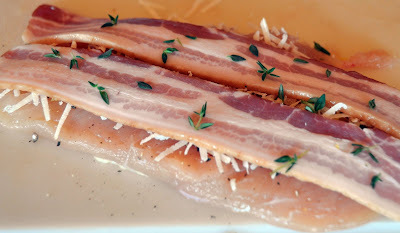 Carefully transfer the chicken breasts, bacon side down, into the pan. Cook for 3-4 minutes, flip to other side and cook for 3-4 minutes and then flip again. Finish with the bacon side down, giving it extra time to crisp up (couple minutes). You and I would be such good friends as I have been obsessed with bacon lately as well! 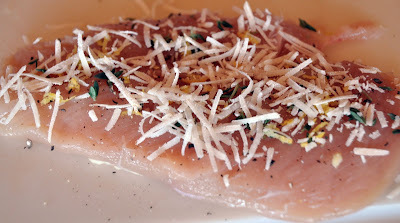 I love parmesan chicken but this just makes it so savory. Those potatoes look yummy as well! Adding bacon will sure enough make this chicken breast moister, and delicious. Very clever Tonya! I like that idea. Hey, I was inspired by Jamie Oliver this week too! I didn't follow a recipe but I got the idea to make a beef stir fry after I saw his show, "Food Revolution." This dish looks really good. I've never fixed chicken cooked with bacon but it sounds like a good combo. This will def. be on my list of Graham musts~! Good grief, I have to try this! The bacon.... It has to be delicious. Now I have to go back to the store and buy some chicken! This looks incredible with the addition of bacon. 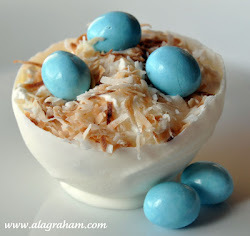 Super YUM! Bacon is incredible! Awesome post. Oh, I thought they were done in the oven. This way is quick.